Butterscotch is a confectionery whose primary ingredients are brown sugar and butter, although other ingredients such as corn syrup, cream, vanilla, and salt are part of some recipes. According to "Housewife's Corner" in an 1848 newspaper, the real recipe for making “Doncaster butterscotch” is one pound of butter, one pound of sugar and a quarter of a pound of treacle, boiled together. Treacle is a British term for molasses. Butterscotch is similar to toffee, but for butterscotch the sugar is boiled to the soft crack stage, and not hard crack as with toffee. Butterscotch sauce is often made into a syrup, which is used as a topping for ice cream. 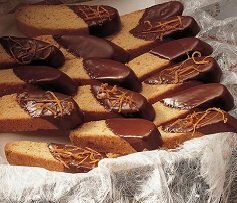 Butterscotch is also used as a flavor in the baking or making of cakes, puddings, and cookies. 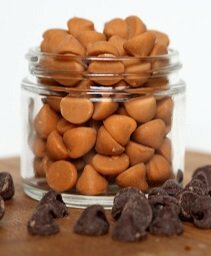 It can be bought in "butterscotch chips", similar for baking use to chocolate chips. The individually wrapped hard candies (butterscotch disks) with an artificial butterscotch flavor, not actual butterscotch. I buy most of my extracts and chips from OliveNation, they are of a much better quality and taste than what you can find at the supermarket. If you would like to try them check it out here! 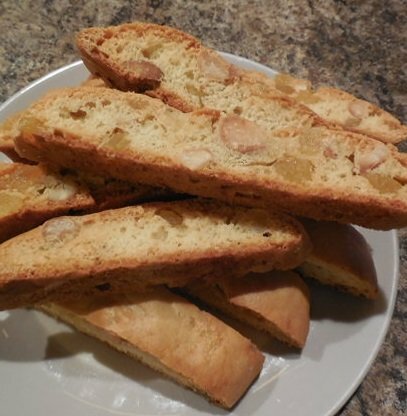 They make great cookies when combined with pecans so why not a Butterscotch Biscotti? In a mixing bowl, cream the oil and sugars together until well blended. Stir in vanilla and butterscotch extracts. Blend in eggs one at a time. I another bowl whisk together the flour, baking powder and salt and then fold into the wet batter. Fold in butterscotch baking bits and pecans. Turn out onto floured surface knead briefly and divide in half. Repeat with other half and then flatten logs so they are about 2-1/2 to 3 inches wide and 3 inches apart. Place in oven and bake until set and lightly browned, about 25 minutes. Return to oven and bake first on one side, about 12 minutes, then turn over and bake other side about 5 minutes. 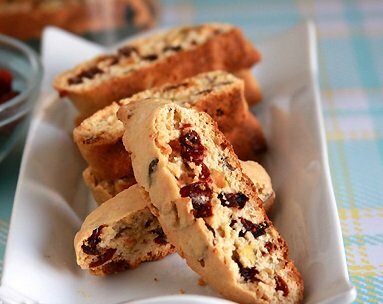 *Baker's Trick: For ultra thin biscotti that are easily cut, after the first baking, wrap each log of baked biscotti and freeze overnight. Next day slice as thin as you wish and bake the second time to brown and crisp them up.